Temporary signs have been placed along the entire length of the Huron River. Listen to the Environment Report on fish contamination by PFAS chemicals. If there is a toxic substance in the river, all the organisms in the water get a bit of it. So, if a small fish eats something such as insect larvae, it’s taking in all the toxic material in the larvae. Then, when a bigger fish eats that small fish, it gets all the toxic substances from all the larvae the little fish ever ate. 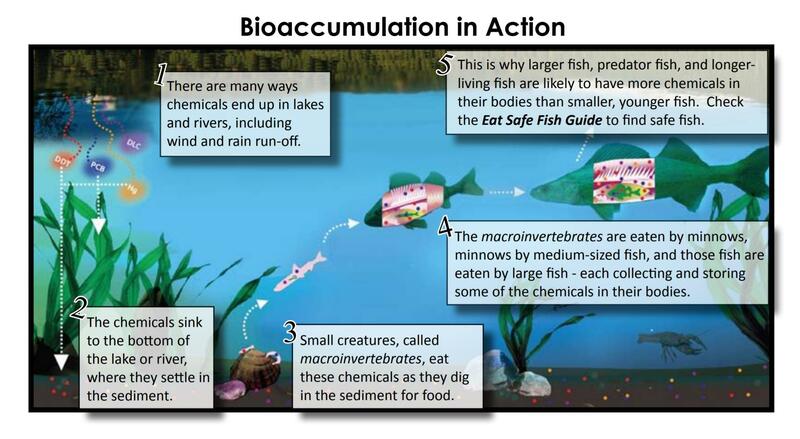 As that bigger fish eats more little fish, the toxic chemicals build up in that fish. You catch the fish. You eat it. You get concentrated PFAS chemicals in you. The more contaminated fish you eat, the more PFAS chemicals will be in your body. That could cause serious health problems. The state’s top medical executive, Dr. Eden Wells, says it’s a good idea to check whether the fish you’re catching and eating are safe. As samples from fish show PFAS contamination, Wells says the state of Michigan issues ‘don’t eat the fish’ advisories for parts or all of a river. 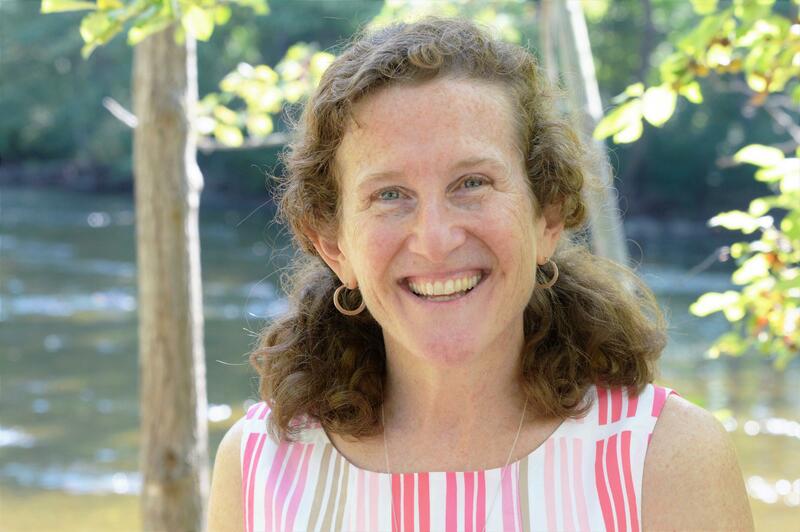 Laura Rubin with the Huron River Watershed Council. That’s what happened to the Huron River recently. At first, just parts of the river were affected. Laura Rubin with the Huron River Watershed Council says then, “don’t eat the fish” warnings were extended. “So that it now encompasses the entire river from its headwaters down to Lake Erie. And we recommend too that you don’t eat fish even in some of the tributaries because fish migrate from the river to the tributaries,” she explained. Next to the Huron River as it flowed through Ann Arbor, families were playing in the water. The science is still not clear about how well skin acts as a barrier to PFAS chemicals, but contact is believed to be a lower risk. “We are still encouraging people to swim, and kayak, and get in the water. Don’t eat the fish. Don’t inhale or eat the foam. You know, we know those kinds of things are dangerous,” Rubin said. That foam she mentioned is PFAS chemicals frothed by churning water. Across the state in Rockford, the Rogue River flows past the site of a now demolished Wolverine shoe tannery. It used a waterproofing compound called Scotchgard. It contained a PFAS chemical. It’s now found in the river. 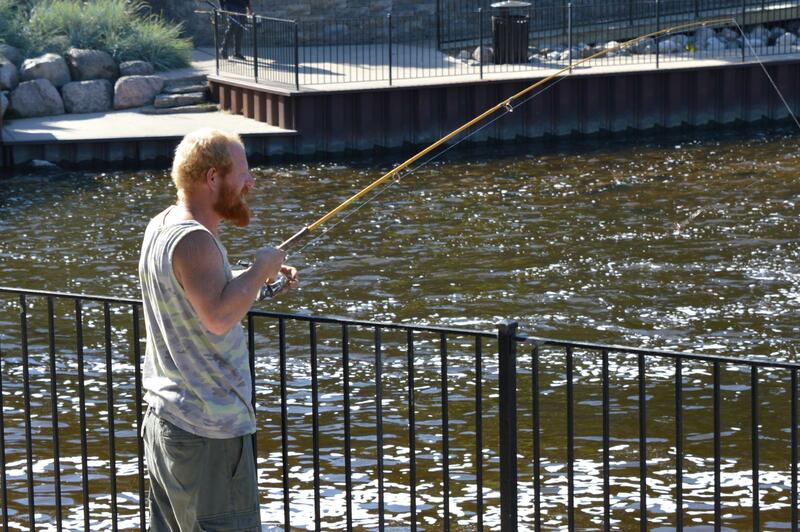 Trevor Griffee fishing off of the Rogue River dam in Rockford. Few people enjoying the trails and the recreational areas around a dam on the river knew about the PFAS contamination. There were no “Do Not Eat the Fish” signs visible. Trevor Griffee was fishing off the dam. He says knows about the PFAS pollution, but he’s not worried. “I’ve been eating the fish for 30 years out of here. I ain’t going to change now. I’m still alive," he said. That's a sentiment heard from anglers across the Great Lakes region about other contaminants in fish such as dioxins, PCBs, and mercury. Some researchers say instead of health advisories being limited to one contaminant at a time, perhaps health officials should be looking at the risks of the chemical mixtures in fish (see story here). In Oscoda Township near Lake Huron, there’s greater concern. There are signs along the AuSable River warning against eating the fish. Oscoda is a resort area. Fishing is a big deal here. Township Clerk John Nordeen says they want the state to keep them better informed about whether the fish are safe. 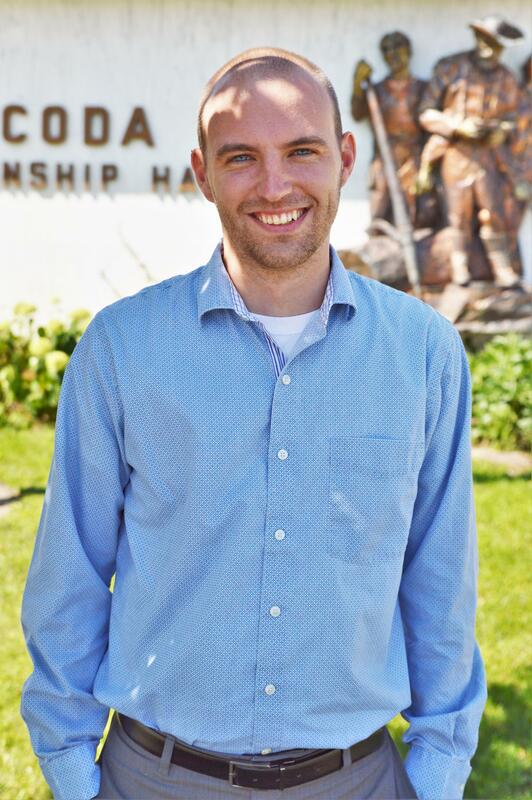 Oscoda Township Clerk John Nordeen. “It’s a major concern by citizens, asking for quicker or more frequent sampling and to have the data returned to us quicker. There’s definitely a lot of concern because it’s not just, you know, for leisure, but it’s economic as well for us,” Nordeen said. There’s a problem with getting information to communitites quicker: the state has a backlog of fish to test because so many samples are being taken. The fish that led to the Huron River “do not eat the fish” advisory was caught almost a year-and-a-half ago. Laura Rubin with the Huron River Watershed Council says what’s happening to Michigan’s water is discouraging. Because these PFAS chemicals are persistent “forever chemicals,” it will be a long time before contaminated rivers and the fish in them are safe again.